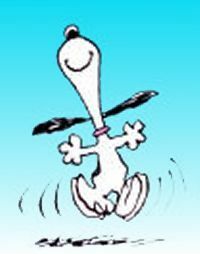 No one does the happy dance better than Snoopy! I finally finished the first draft of my next Grant Starr thriller. I wish I could tell you its title, but I don't know what it is. I began writing this book in April of 2011 and had planned on publishing it in the fall of 2011. Unfortunately, life happened and other things became more important than finishing a novel. I was tempted to ditch the project for personal reasons, but thought it had merit and deserved to be fleshed out. It weighed in at about 45K words when I set it on the shelf last June and comes in at 131K as a first draft. CANALS ended up at 140K and the THE MIGHTY T at about 100K. I have to admit it was very difficult to complete. I have a great idea for the third Grant Starr thriller, so good it was difficult to ignore its pleas to be written. This book begins and ends at a "bloodless" Portuguese bullfight, held in a small town about thirty miles from me. They're called bloodless because the bulls aren't killed or hurt, unless you call having to chase a horse or a skinny man dressed funny around the arena being hurt. I've attended two of these bullfights and they're some of the most exciting events I've ever attended. I wanted to do something a little more challenging this time: I wanted to have two plots that intersected. I don't care to read overly complicated genre books, so I don't write them. As with THE MIGHTY T, the reader will now who done what to whom pretty early in the book. The suspense comes with wondering if they're gonna get away with it, or get caught. I'm not telling! Hopefully it will be ready for publication in July. Thanks Eden. As I said, it's going to need a LOT of editing and rewriting. Bullfight season started here in April and will run until October, so it's hard NOT to be here during bullfight season. We're taking our girls to one in June. A patient of mine runs the concession stand, so she gets there early and lays blankets on the benches to reserve seats. We sit with her family, who've all been patients. It gets surprisingly cold at night because of the winds, but we have a great time.